This course is relevant to whatever production system you use. Due to better breeding, stricter selection and scientific feeding the modern pig can produce good quality pork or bacon. The feeding system and age at slaughter will determine what the pig will produce. Learn about pig biology and production; covering such things as breeding and selection, feeding, diseases, boar management, managing the sow and litter, fattening pigs, record keeping and more. Learn pig management: for commercial production, self sufficiency, or a hobby. This course is relevant to whatever production system you use. A sound foundation course, it develops a broad understanding of pig biology and production; covering such things as breeding and selection, feeding, diseases, boar management, managing the sow and litter, fattening pigs, record keeping and more. There are 9 lessons in this course. The Asian pig had short legs, a wide dished face and the ability to fatten rapidly. The influence of this pig can be seen in the Berkshire and Middle White breeds. The European pig was thin with a long, pointed face. 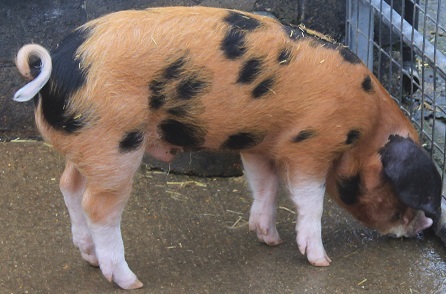 The Tamworth is a modern pig that shows these characteristics. Fixing and improvement of breeds has been taking place for over one hundred years. Bacon type: for the production of cured meat, bacon and ham. Of all the farm animals, the non-ruminant pig has the greatest capacity to accumulate body fat early in life. Early maturation has been obtained to a far higher degree than in sheep and cattle. Increasingly, however, people do not like too much fat on a joint or rasher of bacon. The challenge for the pig farmer is to control the growth of the pig so that the animal is not too fat at slaughter. Pork types are usually slaughtered at 55 - 77 kg live mass while bacon types are slaughtered at 90 kg live mass. The main difference between pork and bacon types is one of early maturity. Until recently, pork breeds were considered early maturing and bacon breeds were later maturing. If a pork type pig was kept on to bacon weight it would become too fat, while a bacon type slaughtered at pork weight would be too immature and unfinished. In modern pig husbandry, it is not so important to choose a pork type or a bacon type. Due to better breeding, stricter selection and, above all, scientific feeding the modern pig can produce good quality pork OR bacon. The feeding system and age at slaughter will determine what the pig will produce. By feeding scientifically balanced pig rations, the farmer can manipulate the growth and fat formation of the animal to produce exactly the type of end-product he requires. The best prices are obtained from first grade carcasses. The pig has been a source of meat for man for centuries and has historically scavenged around human settlements. It became known as the "poor man's cow" because it can convert kitchen scraps, roots, nuts and foliage into enough meat for a family for a year. The high fat content of pig meat allows it to be more easily preserved than other livestock carcass which has made it popular where there is no electricity. Today, with much of the population living in cities, pig farming has become a commercial venture. Curing is no longer necessary as the development of refrigeration allows more pig meat to be sold fresh. The pig is the most efficient meat producing farm animal that we possess and, next to the dairy cow, the most efficient converter of cereals and their by-products into an edible product containing animal protein. It stands to reason, therefore, that the pig should fit in well with cereal farming (such as corn or wheat). Pigs also fit in well where there is a concentration of dairy farms as they thrive on the by-products of industrial dairies that serve these farms. They are a very omnivorous animal: They eat a very wide variety of foods from virtually anything man eats, through to grass (Grass alone is not a sufficient diet though). Pigs will eat virtually any vegetable matter you give them. In many ways, they are perhaps the cheapest source of meat to grow. They can tolerate severe cold or wet, but need a dry place to sleep. Pigs can be allowed to free range, but if they are, they can cause damage. They are best kept in a fenced area, or a pen.